Welcome to our mountain holiday home. We proudly offer our suite to you and your family to enjoy. Located slope-side in the Aspens on Blackcomb.The Aspens offers ski in/ski out accommodation in one of the best hill locations in Whistler. 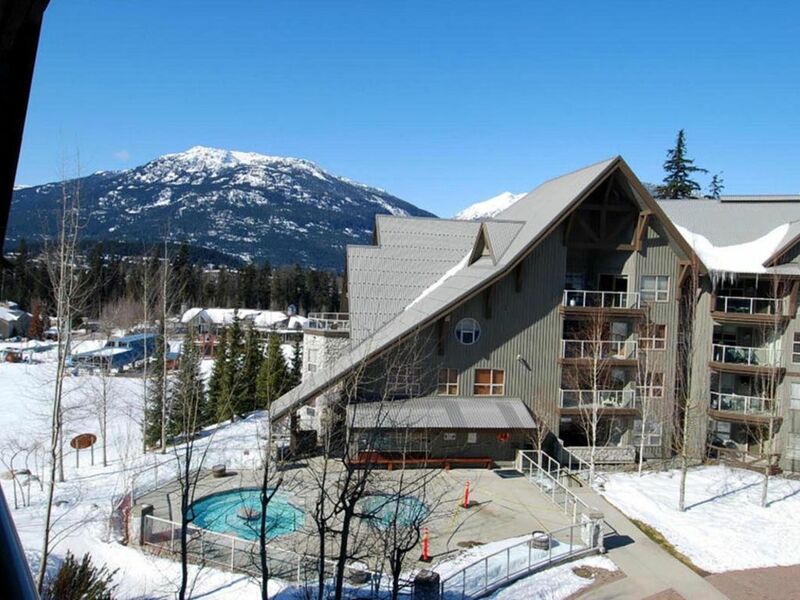 It is situated on the slopes of Blackcomb Mountain just a short ski or walk down to the Wizard Express chair lift and the children's ski school. The Aspens is equipped with a heated swiming pool and three hot tubs, as well as a fitness room, laundry facilities, secure ski storage and under ground secure pay parking - all this within easy skiing or walking distance of the village and all its amenities. The Aspens is just as convenient in summer - close to Lost Lake and the Upper Village Adventure Zone. Property highlights: Top floor suite. Amazing views. Great large deck with BBQ. Sleeps up to six guests: King bedroom, twin bedroom, and queen sofa bed in the living room. Two full bathrooms. Well-equipped kitchen. Shared swimming pool and hot tubs. Fitness room. Secure underground pay parking available. We have provided all the luxuries of home and hope you will enjoy our suite and your visit to Whistler Blackcomb. We are a Vancouver family that can't get enough of Whistler. From skiing and sledging to biking and swimming, The Aspens is the best family-friendly complex in Whistler. Best ski in ski out location, quiet, great facilities. Possibly the best slopeside location in Whistler. The Aspens on Blackcomb is located in the Upper Village, just up the slope from the Wizard Express high speed chair lift. Free local, long distance and international calls (60 countries). The telephone is a cordless Panasonic, with one handset in the master bedroom and one in the living room. Air conditioner in living room during summer months. House keeping provided before check-in and after check-out, as well as midway cleaning for guests staying ten nights or longer. Coin operated On the main floor of the complex. A cosy natural gas fireplace; easy to use. Underground pay-and-display parking is available for $17 per day per vehicle. Guests pay for parking on arrival at the ticket machine located just inside the lobby. Free wireless internet access is provided in the suite. The router supports 802.11 b/g/n/ac (2.4 and 5 GHz). A 15 ft Ethernet cable is also available for wired use if needed. Treadmill, bike and elliptic trainer. Fitness room looking out on the slopes. The kitchen is fully equipped with everything you need to prepare a fully cooked meal. Open Living / Dining room, very bright with lots of windows and great views. Gas fireplace in living room. Patio doors out to deck with extra seating. The TV is a Panasonic 42-inch plasma 1080p HDTV with USB and HDMI hookups on the side for iPods and cameras etc. It has an Apple TV (third generation) attached for AirPlay etc. Shaw HD cable TV is provided free. Panasonic mini-stereo in living room that plays CDs, with Lightning iPhone dock, AirPlay, Bluetooth, USB and RCA inputs. Panasonic Blu-ray player. Also plays DVDs and CDs. Some Blu-ray discs and DVDs are provided in the TV cabinet. The balcony features a love seat and two chairs with cushions and a coffee table, with a great view down to the pool deck and over the rooftops to the mountains. It faces north west. Bike storage available in underground parking. Ski shop and valet operates during peak ski season. Bike storage available in underground parking. Mini golf just down the hill, two golf courses close by. Great location. Easy ski in/out. Simple walk down the hill to Blackcomb base and just a few minutes to Whistler Village. Looking forward to renting again. Amazing place to stay, great equipped kitchen, comfortable beds, enough room for everyone. The only frustrating thing was the fact that the one jacuzzi outside in the common area was not working. It was too busy to get a spot in the one that are working. But that’s not the owners fault. The property should take care of it. The apartment is fine for two adults and two kids under age 10. Twin beds were hopelessly small and uncomfortable. King bed in master bedroom had a horribly uncomfortable mattress. View from apartment was wonderful and all of the basics, except beds, were very good. Clean. Lots of towels and amenities. Please - replace the twin beds, there's plenty of room for doubles. What a lovely rental for a Whistler get away. A clean, functional, beautiful unit in a can't beat it location! The pool and hot tub were also well maintained and wonderful after a day on the best ski runs in the world! Steps to the new Blackcomb gondola make this a win win!! We had a wonderful stay for a week with our two young children. The ski slopes, hot tub, and pool were just down the stairs and the condo was well appointed and kid friendly. We thought we might miss not staying in the village, but being on the slopes proved to be a great choice. Great condo to stay in. Everything was clean and the owner was excellent to deal with. Would definitely rent this condo again. he Aspens offers ski in/ski out accommodation in one of the best hill locations in Whistler. It is situated on the slopes of Blackcomb Mountain just a short ski or walk down to the Wizard Express chair lift and the children's ski school. The Aspens is equipped with a heated swiming pool and three hot tubs, as well as a fitness room, laundry facilities, secure ski storage and under ground secure pay parking - all this within easy skiing or walking distance of the village and all its amenities. The Aspens is just as convenient in summer - close to Lost Lake and the Upper Village Adventure Zone.